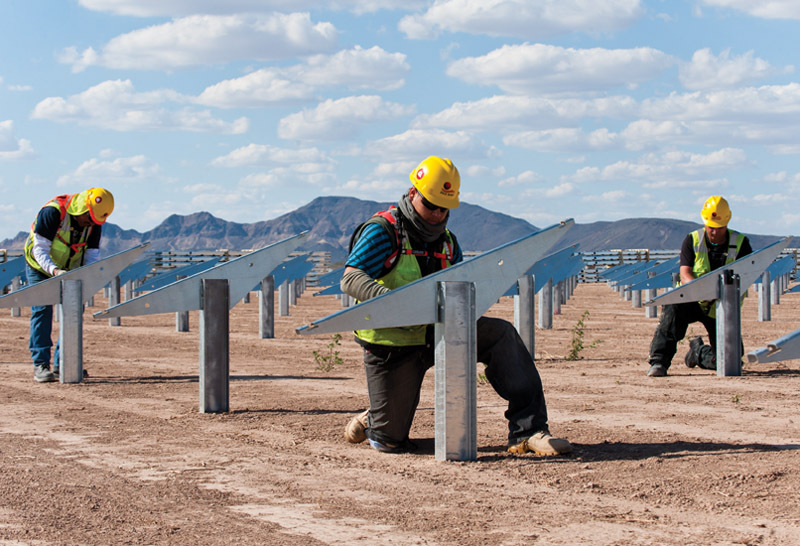 Work has now been completed on the first phase of the massive 290 MW Agua Caliente solar project in Arizona which, when fully complete, will be the largest PV project in the world. 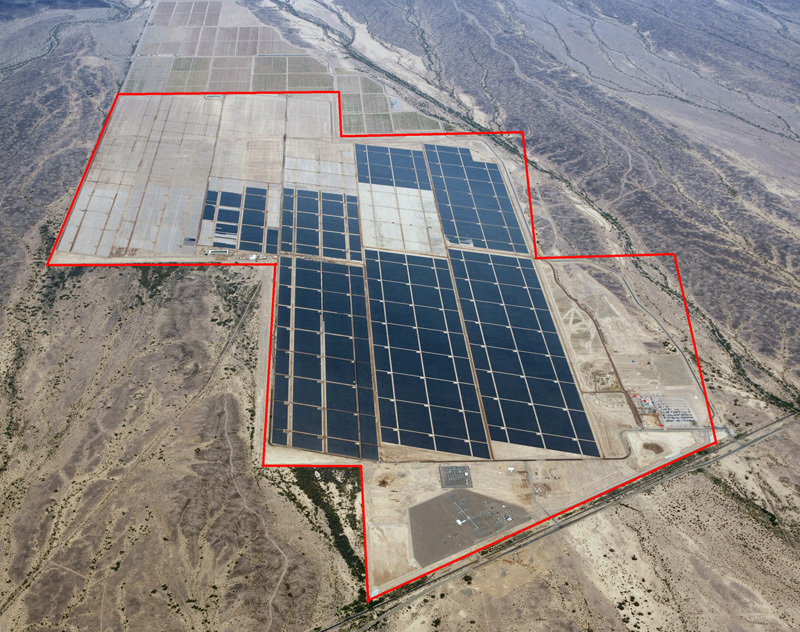 First Solar attributed Agua Caliente's success to date to the company's integrated approach. That means having the right overall team in place, from the engineering team that starts out the project, all the way through to the construction team that builds the project. During the past four years, teams within First Solar Inc. of Tempe, Arizona, have honed their skills and developed photovoltaic arrays that can be installed and brought online in blocks, all in anticipation of much larger PV projects. Those concepts are now being put to the test with the 290 megawatt Agua Caliente project currently under construction near Dateland, Arizona, about 65 miles east of Yuma. When fully complete and online in early 2014, Agua Caliente will be the largest PV project in the world. for a project like this," said Justin Bloch, First Solar project director in Tempe. "We built smaller projects and practiced the small-scale type installation. Once you perfect that 1 to 1.5 MW array, you can up-size that to be any size of plant." But the No. 1 title will be short-lived as First Solar has two massive 550 MW projects in the pipeline—the Topaz Solar Farm in eastern San Luis Obispo County, California, and the Desert Sunlight Solar Farm in Riverside County, California—that will eclipse Agua Caliente. NextLight Renewable Power LLC of San Francisco began initial work on the Agua Caliente project, which is located on about 2,400 acres of former farmland. Water rights to the land had been sold and the land retired from farming. A major feature is that the Agua Caliente site had the existing Hassayampa-North Gila 500 kilovolt transmission line adjacent to it. In September 2009, the Arizona Corporation Commission unanimously approved Agua Caliente and issued a certificate of environmental compatibility. First Solar became involved in July 2010, when it acquired NextLight and its 1.1 gigawatts of projects in the pipeline. Shortly after that, the California Public Utilities Commission approved a 25-year Power Purchase Agreement (PPA) between San Francisco-based Pacific Gas &Electric Co. and Agua Caliente Solar LLC. First Solar continued development of the project. About the time the firm was moving heavily into the construction phase, NRG Energy Inc. of Princeton, New Jersey, acquired the project in August 2011, Bloch said. Under the arrangement, First Solar remained as the EPC contractor. Once the project is completed, First Solar will also perform operations and maintenance for the next 25 years, he said. 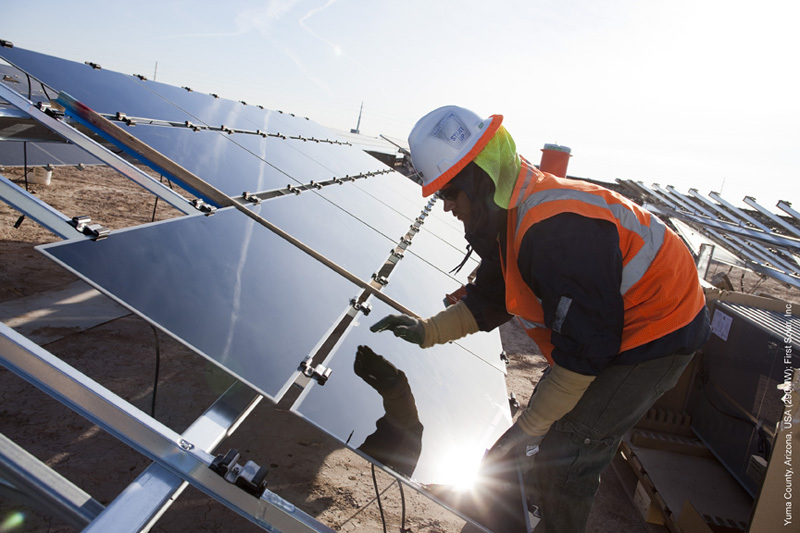 Not only was the project's sheer size attractive to NRG, it also had several other attributes, said Randy Hickok, vice president of asset management for NRG's solar subsidiary in Carlsbad, California. "We liked the size and location, and we liked its technology," Hickok said. "As far as solar insolation, it's hard to do better than where the project is located, and obviously that is what makes it a strong project. NextLight Renewable Power LLC of San Francisco began initial work on the Agua Caliente project, which is located on about 2,400 acres of former farmland. First Solar acquired NextLight in 2010. "We've done other projects with First Solar, and those projects have gone well. This one had a PPA already set up with the utility, and it was permitted and ready to go." The choice of more than 400 Sunny Central 720CP inverters from MA America LLC in Rocklin, California, was also a selling point, Hickok said. The inverters are designed for large, open-field PV plants and designed to withstand temperatures up to 122 degrees Fahrenheit, or 50 degrees Celsius, according to SMA information. "What's novel about this project is primarily the inverters—it's an evolutionary step, not a revolutionary step," he said. Inverter technology is pretty well understood, Hickok said. What's different about the SMA unit is its ability to provide grid stability. If there's a momentary surge in the current, most other inverters would disconnect the facility from the grid. The SMA inverter can keep the plant connected during voltage and frequency excursions and produce power at the prior level once the disturbance is cleared. The system can also monitor grid voltage and automatically adjust the plant's reactive power output to help maintain grid voltage within prescribed bands. Such a large alternative energy project carries a big price tag. In August 2011, the Department of Energy approved a $967 million loan guarantee for Agua Caliente, which was "very, very important," Hickok said. "Projects of this scale are obviously capital intensive," he said. "Given the economic climate at the time that all of this was in the works, private financing wasn't available on that scale." In January, MidAmerican Solar LLC of Phoenix, a subsidiary of MidAmerican Renewables LLC, acquired a 49 percent stake in the $1.8 billion Agua Caliente project as well as First Solar's Topaz Solar Farm. Bloch attributed the project's success to date to First Solar's integrated approach. "It's about having the right team in place, from the engineering team that starts out all the way through to our construction team that builds it," Bloch says. That also includes the procurement team, which lines up material suppliers and fabricators. At the same time, the logistics department plans out just-in-time material deliveries. Most of the project's five million or so thin-film panels are from First Solar's Perrysburg, Ohio, plant; however, smaller supplies are being sourced from First Solar's plants in Malaysia and Germany. Bloch said the project also used 50,000 tons of steel for posts, tilt bracket mounts, and tables. Agua Caliente is only one of several large-scale PV projects First Solar has going. One of the procurement team's responsibilities is to secure alternate material sources should a supplier have problems delivering on time. "When you have the work force there, you don't want people without materials," Bloch says. The materials are delivered to the site by truck or rail. From there, the construction team takes over. Most of Agua Caliente's five million or so thin-film panels are from First Solar's Ohio plant. The project also used 50,000 tons of steel for posts, tilt bracket mounts, and tables. All of the components have been designed for ease of installation. This allows First Solar to take advantage of local, qualified labor that is subsequently trained by company representatives. "Someone installing the posts can also be part of the tilt bracket crew and the table crew as well," he said. "It gives us the flexibility to speed up or slow down different components." As part of site preparation, crews conducted extensive soil sampling. The data was used to determine how deep to drive the posts that support the tables, which is what First Solar calls its racks. Typically, the posts are driven four to eight feet. The post crew started at one corner of the site and moved across it, followed by the tilt bracket and table crews, and ultimately, the wiring crew. In order to keep up with the speed of installation, Bloch said it became apparent that First Solar had to go into the post-driving business and brought in part of its fleet of customized post-drivers. The machines drive the posts at a predictable speed and velocity, allowing the project to stay on schedule. Post driving was completed earlier this year, and the post-driving machines have since been moved to other projects. Unlike wet climates where steps must be taken to cope with moisture and water, the desert presents its own set of challenges, Bloch said. First Solar must mitigate fugitive dust that might be created during construction. During the summer, workers also have to be protected from extreme daytime heat and reminded about proper hydration. "What we think about first before anything else is safety," he said. First Solar also built a substation to deliver the electricity into the California ISO power grid. The substation is adjacent to the switching station built by Arizona Public Service Co. The project is being brought online incrementally in blocks, with 30 MW brought online in January and another 30 MW in February, Hickok said. Altogether, this phase of the project was about 60 percent completed by December 2011 and is on track to be completed on time, Bloch says. First Solar's 25-year O&M agreement will allow it to continue to collect data that can be applied to future projects. "It's all about optimizing energy yield," Bloch says. "We try to filter knowledge up and down the line to make ourselves better." Although the overall project is still more than a year from completion, it already has drawn accolades from peers within the industry. In 2011, Agua Caliente received the Solar Project of the Year from Renewable Energy World and PV Project of the Year from Solar Power Generation USA. "We're happy for the recognition of the project," Hickok said. "We think it reflects everything we saw that attracted us to the project. It's a great site, great deployment of new technology and new inverter technology. And it has everything going for it, including community support." Bloch agreed. "It gives all of our teams a sense of accomplishment. I have to give a lot of credit to our entire team. They make it seem effortless."